Libratone Q Adapt In-Ear: because you decide how much of the world to let in. Q Adapt features Libratone’s Signature Sound Profile designed to provide a full range of crisp, clear, enhanced sound. 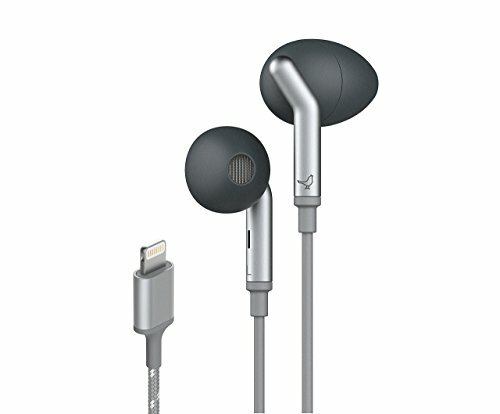 The Q Adapt In-Ear offers 4 levels of CityMix Adjustable Noise Cancellation for your Lightning connected iOS device. Level 1: Keep the music playing while still letting in 80% of outside sound. Talk to people around you without removing your headphones. Level 2: Enjoy your music with maximum awareness and safety with 60% of outside sound, making them great for commuting. Level 3: Stay focused by blocking outside noise while still allowing people to get your attention when needed. It’s perfect for a busy office or studying in public. Level 4: Totally immerse yourself in sound by blocking 100% of outside noise whether traveling by plane or simply silencing your world. CityMix ANC allows you to enjoy music at any volume by activating the ANC to cancel outside noise, then play on. Because simplicity is everything, the four-button remote lets you access CityMix, activate the Hush function, Play, Pause, make and take calls, or crank up the volume. Unlike other noise-cancelling, in-ear headphones, Q Adapt draws power directly from your iOS device. The lightning-powered earbuds are more efficient, too – they won’t drain your battery, so you can use ANC for 50+ hours on an iPhone 6 Plus or 7. Libratone Q Adapt In-Ear headphones are compatible with iOS devices with a lightning port including iPhone 5, Phone 5C, iPhone 5S, iPhone 6/6 Plus, iPhone 6S/6S Plus, iPhone SE, iPhone 7/7 Plus, iPad (4th gen), iPad Air, iPad Air 2, iPad Pro (9.7" and 12.9" models) iPad Mini (1st gen), iPad Mini 2, iPad Mini 3, iPad Mini 4, iPod Nano (7th gen), iPod Touch (5th gen), and iPod Touch (6th gen). Libratone is proud to offer the best lightning headphones on the market, so we provide a 30-day money-back guarantee and we're here to help you with 24/7 US based customer support for all of our products. LIGHTNING POWERED - Designed specifically for and powered by iOS devices, Libratone Q Adapt Earbuds have almost no impact on your phone's battery life. Listen for up to 52 hours with no bulky battery packs. PREMIUM SOUND QUALITY - Our signature sound profile features a balance of enhanced Deep Bass, Full Midrange, Clear Vocals and Crisp High Tones to ensure that all music sounds amazing. THE POWER OF FOUR - Four buttons are all you need to control Q Adapt In Ear. Use the remote to increase and decrease volume, skip tracks, activate the "Hush" function, answer calls and activate and adjust Active Noise Cancellation. Q Adapt's lightweight cord resists tangling and wire breakage..TAKE CALLS - Q Adapt's built-in microphone helps quiet the outside world during phone calls and lets you take calls hands-free and noise free. Q Adapts super comfortable in-ear headphones are designed for prolonged usage with extra ear bud fittings and a carrying case.